Okay, we have been waiting and waiting to announce this fabulous news and have finally been given the go ahead to say something, so here it is: Sony TV has optioned all four novellas from our wonderful MYSTERIA anthology for a cable TV miniseries! 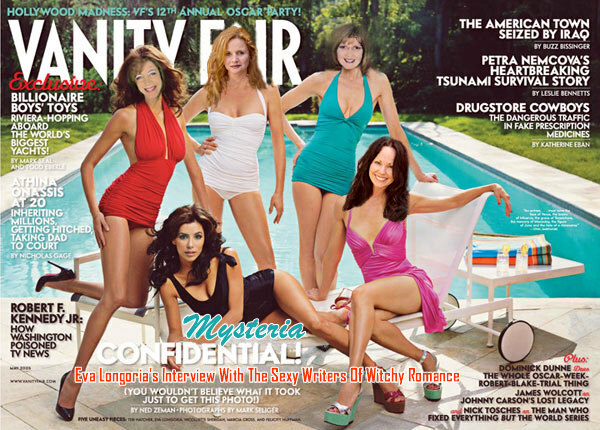 So that's MaryJanice Davidson, Susan Grant, Gena Showalter and moi (please see lovely photo of "us" above). Talk about a wonderful holiday gift! Stay tuned for updates! Let's hear it for the Goddesses! I like to support sister goddess authors (as well as Tor's paranormal/fantasy romance line), so be sure you check out Shannon McKelden's first novel, VENUS ENVY (such a delicious title)! Take one hunky firefighter, one stubborn "Cinderella," and one very reluctant fairy godmother and what do you get? Rachel Greer wants no part of Venus's scheme to land Mr. March as her Prince Charming, but Venus is determined to do just that. She's only a few love-life fixes short of returning to her former goddess status, and she's not letting one mulish mortal stand in her way. It appears the only way Rachel can get rid of the very un-Disney-like fairy godmother is to play along. So she follows Venus's plan to interview Luke Stanton's ex-girlfriends...which Venus believes will cure Rachel's relationship fears, but which Rachel knows will only prove her point that men are never what they appear to be. But, when Venus's plan appears to work, and Rachel and Luke fall in love, does Rachel dare set aside her fears about happily ever? Or will betrayal send her back into relationship seclusion...this time forever? And what happens when a goddess-turned-fairy godmother breaks the most important rule--protecting herself from human emotions? Shannon McKelden has wanted to be a writer since she earned a coveted ‘A+++’ from her 9th grade English teacher. She lives in the Pacific Northwest with her high school sweetheart, two kids, two cats, a dog and a crow. Ty MacAnlup has seen the tragedy that a mating between a werewolf and a human can bring and he wants no part of it, no matter how much his body and heart ache for a taste of Frankie's softness. Frankie has loved Ty for years and while she doesn't know he's a werewolf, or even that such things exist...she does know that to her, he's always been more than a mere man. Ty's hidden beast wreaks havoc with his determination to stay away from Frankie when they are trapped together in a small cabin in the snow bound wilderness.